This was a Birthday at home in a large garden at a house in Moor Hall. The event was a casual garden party for 120 guests. The guests arrived through the house to a 30ft x 40ft Marquee on the rear of the house. Due to the various split levels, patios, and water features in the garden, a sub floor was constructed to form a level platform on which the marquee was erected. The Marquee was lined with a star cloth throughout with blackout walls, up-lighters, and a roof lighting rig. 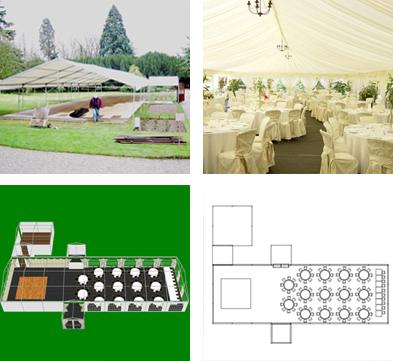 The Marquee was carpeted with charcoal marquee carpet, with a large Black & White dance-floor.